VMware Log Insight (vRealize Log Insight: Intelligent Log Management & Analytics) is a nice product and it’s certainly been useful in my environment. There was however one major issue I had with the product, you had to upgrade your license to gain the ability to replace the default self-signed SSL/TLS certificate on the web interface. I really didn’t like this as it felt like a paywall to security – I mean it’s 2016 and you are going to limit my ability to secure the interface unless I pay? Anyway I took my frustrations to VMware both via the usual reporting channels/social media and via our VMware account manager and technical rep. They took on board what I had to say and agreed that this wasn’t really ‘great’ and to my great joy the latest version of Log Insight (4.0) no longer blocks you! 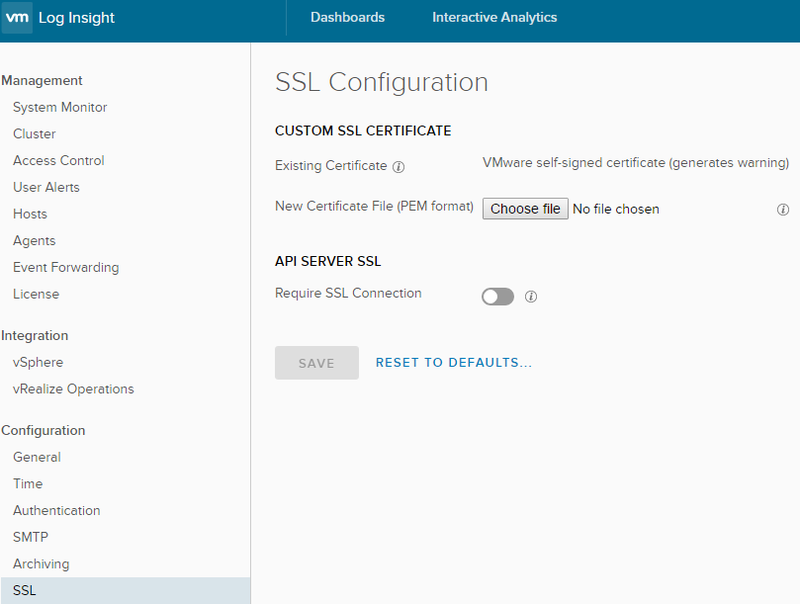 As you see, now when we navigate to the SSL menu we are presented with the options to add a custom certificate and enable SSL for the API interface. This is great news and a move in a positive direction for Log Insight.